In 1924, at a time when most people had never seen a plane, the public’s imagination was captured when the U.S., Portugal, France, UK, Italy, and Argentina competed to fly around the world. A team of eight members of the U.S. Army Air Service—four pilots and four mechanics—set off from Seattle with high hopes The open-cockpit planes, which needed constant maintenance and repairs, could switch from wheels to pontoons for water landings. Thanks to the massive press coverage and a detailed journal kept by one of the mechanics, the author incorporates many quotes that give a sense of immediacy to the fast-moving narrative. Eye-catching graphics add interest with historic photos and artifacts as well as excellent maps pegged to each chapter. Back matter includes a glossary; their itinerary; the number of days, time in the air, distance, stops, and countries; endnotes; bibliography; and index. The book was published in association with the Smithsonian National Air and Space Museum, which has one of the planes on display. 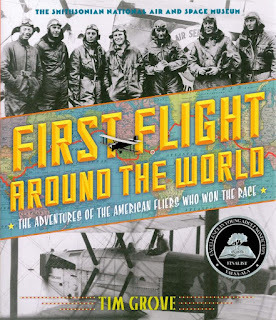 This is a terrific way to learn about the time period, aviation and transportation history, and world geography. Internet Tie-in: One of the planes, a Douglas World Cruiser built specifically for the flight, is at the Smithsonian National Air and Space Museum in Washington, D.C. Students can see it online at the museum’s website, which offers a wealth of material including photographs and videos on all aspects of flight. Freedman, Russell. 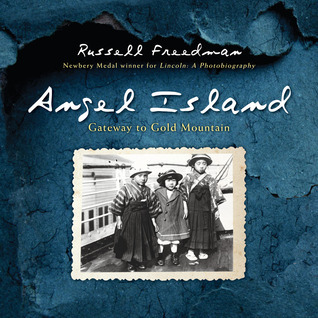 Angel Island: Gateway to Gold Mountain. Clarion, 2013. 96pp. Lexile 1140. While most people think of Ellis Island as the historic entry point for immigrants, more than a half a million newcomers entered the U.S. through Angel Island in San Francisco Bay. From 1910 to 1940, immigrants mostly from Asia spent weeks and even months anxiously waiting to see if they would be admitted. This excellent history quotes from transcripts of the interrogations that decided their fates and incorporates poignant poems in Chinese characters that still adorn the walls of the buildings. Well-chosen historic photographs enhance the exploration of the island’s history, individual stories, and the discrimination and hardship that Asians faced here. One chapter focuses on women and another on non-Asian immigrants. The narrative wraps up gracefully with the story of how the island and buildings were preserved and became part of a state park in 2009, thanks to activism by the Asian-American community. A gem for the curriculum or independent reading. Crowe, Chris. Getting Away with Murder: The True Story of the Emmett Till Case. Dial, 2003. 128pp. Lexile 1210. Emmett Till would have been 74 this year. He was born in 1941 and killed on August 28th, 1955. 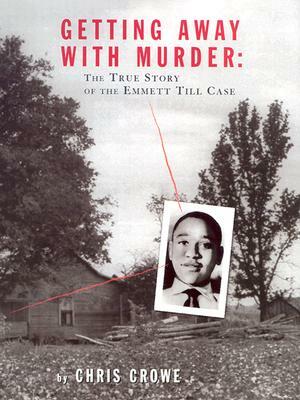 The murder of Emmett Till and the trial in which his killers, who later confessed, were acquitted had a profound effect on the Civil Rights Movement. This painful but important story concerns Till, a fourteen-year-old African-American boy from Chicago, visiting his relatives in small-town Mississippi in 1955. Having allegedly called a white woman “baby,” he was kidnapped, tortured and murdered by local white men. Crowe conveys the vicious prejudice and the sense of white superiority that led to Till’s death. The straightforward writing lets facts and quotes speak for themselves. It sets the murder and trial in context, shortly after Brown v. Board of Education was decided, and at a time when blacks and women could not serve on Mississippi juries. The country’s stunned reaction to the photographs of Till’s body and the unjust trial come across as well. Black-and-white photographs, a timeline, lists of further reading and websites, and a bibliography enrich the book. Fiction, Poetry, & Drama Tie-ins: Crowe lists several responses in art to the Till story: plays by Toni Morrison and James Baldwin, a Bob Dylan song, and a Gwendolyn Brooks poem. Crowe has also written a novel, Mississippi 1955, that tells the story of Till’s murder and trial through the viewpoint of a white teenager. Pair any of these with the nonfiction book to show different approaches to the same subject. Older readers may appreciate the beautiful, intricate sonnets in Marilyn Nelson's A Wreath for Emmett Till. Montgomery, Sy. Photographs by Nic Bishop. Chasing Cheetahs: The Race to Save Africa's Fastest Cats. Houghton, 2014. 80pp. Lexile 1000. Another outstanding entry in the Scientists in the Field series, this introduces Laurie Marker, an American scientist who has opened a clinic in Namibia to help save cheetahs. The excellent team of writer Sy Montgomery and photographer Nic Bishop spends time at the clinic and out in the field with the scientists. They participate in an annual physical checkup of a cheetah, including a dental check that shows the cheetah will need a root canal next year. They accompany other volunteers into the savanna to take a census of the animals. The text and photographs present facts about this remarkable animal and the efforts to keep it from extinction. The book brims over with helpful material including a map, resources list, index, and even "advice for saving world" from Marker. Reading Std #5: Analyze the structure of texts, including how specific sentences, paragraphs, and/or larger portions of the text relate to each other and the whole. 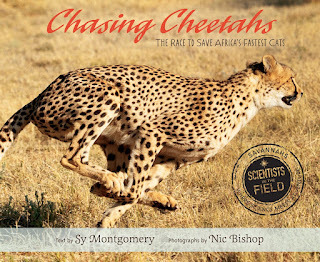 Like other books in the series, this photo-essay weaves together the story of a specific scientist and how she came to do this work; a sampling of her everyday activities as a scientist; a strong sense of setting; and lots of information about the book's focus, in this case, the cheetahs. Have students examine the structure that Montgomery uses to integrate these topics, and how the photographs contribute to the balance. Students can create a quick outline to illustrate their analysis. Bolden, Tonya. 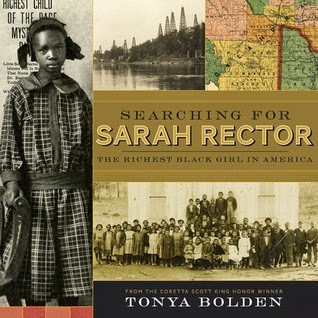 Searching for Sarah Rector. Abrams, 2014. 80pp. Lexile 1050. In my experience, many kids care about the topic of money, making a book about the once-wealthiest black girl in America inherently interesting to them. Sarah Rector was the descendant of slaves owned by the Creek Indian nation, who took them from the South to the West. After the Civil War, those former slaves became known Creek freedmen and each one, including children, received an allotment of land in the area that is now Oklahoma. In 1914, when Sarah Rector was 12, oil was found on her allotment and she started receiving royalties from a drilling company. Along with the new wealth came problems such as who could be trusted to be her financial guardian. Bolden sets the story skillfully in historical context of the slavery and the West. Since facts about Sarah Rector are sparse and not always reliable, Bolden shares her research process with readers. A gorgeous piece of bookmaking, the volume integrates photographs and other graphics to convey time, place, and people. Back matter includes an author’s note, glossary, source notes, bibliography, and index. Reading Information Std #3: Analyze how and why individuals, events, and ideas develop and interact over the course of a text. One of the key elements in Rector's story is the relationship between the Creek Indians and their African-American slaves, including what happened after the Civil War. Have students trace that relationship through this book, and also compare each group's relationship with whites. Interested students might pursue research about the Seminole Indians and black slaves. Murphy, Jim. 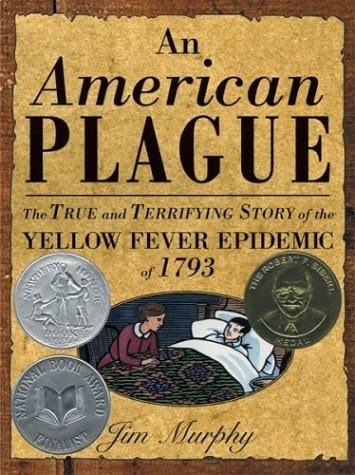 An American Plague: The True and Terrifying Story of the Yellow Fever Epidemic of 1793. Clarion, 2003. 165pp. Lexile 1130. In 1793, yellow fever swept Philadelphia, then the nation’s temporary capital, a tragedy brilliantly recounted in this Sibert Award Winner and Newbery Honor Book. The topic is inherently intriguing and Murphy’s enthusiasm for the topic comes across clearly. The author brings to life key figures like Dr. Benjamin Rush and lesser known ones such as members of the Free African Society who nursed the sick. The dynamic text, which targets the reader’s senses with quotes about sights, sounds, and smells, looks at how yellow fever came to the city, how it spread, and how various segments of the city reacted. Doctors tried to treat it, with very limited knowledge, disagreeing with each other on the best approach. With the national government centered in Philadelphia, the political consequences were severe. 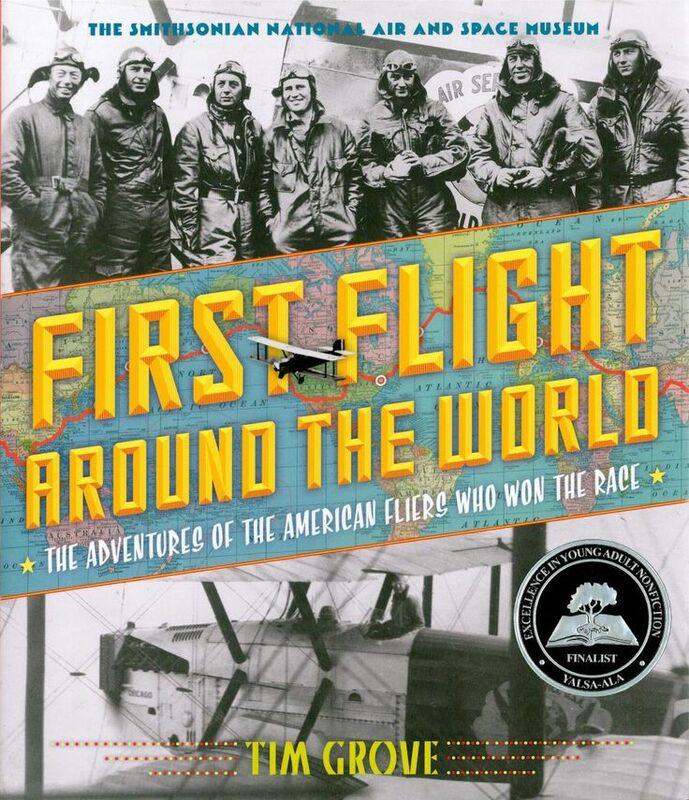 A readable open design effectively uses maps, newspaper clippings, etchings, and other visuals that combine with the excellent writing to make this one of the best nonfiction books for teens. Fiction tie-ins: Pair this with Fever 1793 by Laurie Halse Anderson or Path of the Pale Horse by Paul Fleischman (out of print), both excellent novels about the yellow fever epidemic, set in Philadelphia. Setterington, Ken. 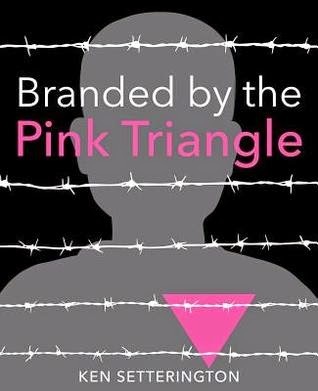 Branded by the Pink Triangle. Second Story, 2013. 196pp. Lexile 1110. Although the Holocaust holds an important place in the curriculum, the subject of how Nazis persecuted the gay population rarely gets much attention. This moving book fills in that gap, combining historical facts and true, often heartbreaking, stories. The text offers historical context, then discusses how gays--mostly men--were located, sent to concentration camps, and suffered and died there. Even those who survived the war continued to suffer since they couldn’t speak out about their experiences in a world where homosexuality was illegal (and still is in many places, as the author discusses at the end). Black-and-white photographs, pictures of artifacts, notes, an index, and a timeline all add to the effectiveness of this important narrative. A Stonewall Honor Book. Reading Std #1: Read closely to determine what the text says explicitly and implicitly, citing specific textual evidence to support conclusions drawn from it. The author excels at integrating stories that make the persecution and suffering feel personal, including one about a male couple who held a commitment ceremony in the early 1930s, only to be separated forever after the Nazis arrested them. Have students identify several such stories and analyze them in terms of language and how they add to the emotional impact of the text. I'm a workshop presenter, book reviewer, author, online instructor, and former school librarian. I give all-day workshops for teachers and librarians on books for teens including The Best Nonfiction for the Common Core (Grades 6-10) and The Best New Young Adult Books (Grades 6-12). In this blog, I annotate excellent nonfiction books for middle school and high school at the Common Core recommended Lexile reading levels, with suggestions for ways to use them within the standards, technology or web tie-ins, and related fiction titles. While Common Core’s Appendix B list of exemplars includes some good nonfiction, it’s a limited, uneven selection. Students need to read books, not just short passages, if they’re going to be ready for college.